Here’s what happens. Fire emits electromagnetic radiation that travels in invisible waves through space. When these waves hit a combustible material or a person, the radiant energy is absorbed and converted into heat. When radiant heat is absorbed by a combustible material, the object catches fire when the material’s ignition temperature is reached. Protecting people from radiant heat is vital because exposed individuals quickly feel unbearable pain, followed by second-degree burns, making safe egress impossible. What are the dangers of radiant heat transfer? Each year lives and property are destroyed by fire — destruction that could be avoided, or certainly minimized, by applying what we know about fire and fire protection. For example, structures that survived the Oakland/Berkeley Hills fire in 1991, which killed 25 people, injured 150 and destroyed more than 3,000 buildings, had several things in common. In addition to having fire-resistive roofing material; large, clear yards; stucco exterior walls; and few overhangs, they had windows that resisted breakage in the face of fire and reduced the transfer of radiant heat. These windows protected a structure’s interior from even the highest heat levels. 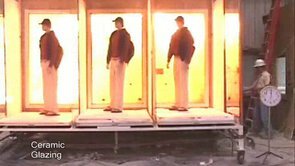 Fire-resistive glazing is designed to block radiant heat transfer from one building compartment to another and protect people leaving a building through an exit corridor. Click here to view a video summarizing the risks of radiant heat. In order to specify the right type of fire rated glass, it is important to look beyond the fire endurance rating (20/45/60/90/120/180 minutes) and focus instead on the overall performance of the glass. Fire-resistive glass, in combination with fire-resistive framing members, is tested for both fire endurance and its ability to limit a rise in temperature on the surface opposite the fire per ASTM E119. 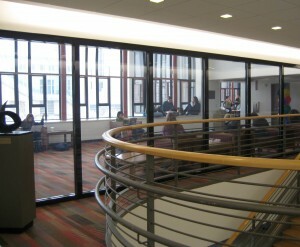 Click here or the image to the right to see a video demonstrating the effect of radiant heat energy passing through three types of fire rated glass – fire protective ceramic Glazing, fire protective Safety Wired Glass and a specialty tempered heat reflective glazing called SuperLite I-XL, which offers partial radiant heat protection. Where should fire resistive glazing be used? 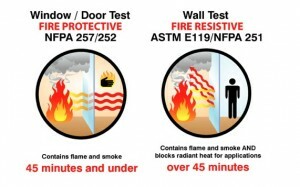 Building and fire codes work to prevent the transfer of radiant heat where the objective is to protect lives or property, where uncontrolled radiant heat can impact occupants needing to exit past glass and where the potential for fire spread due to auto-ignition of combustibles is a possibility. Of particular consideration is the speed with which occupants can pass by the glazing, the width of the corridor, and the amount of fuel on the other side of the glazing. Do labels always show a glazing product’s ability to block radiant heat? 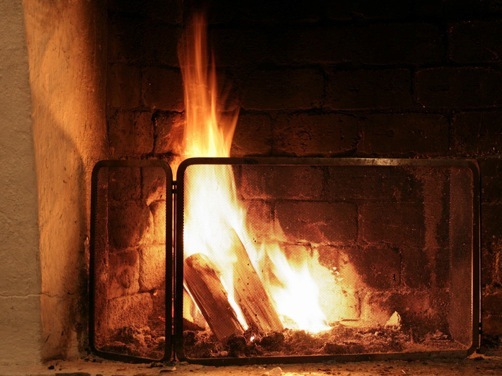 Which products block radiant heat? Insulated products, such as SuperLite II-XL, Pyrostop, Pyrobel, Contraflam, Swissflam, etc. — products that are rated 60-minute plus to ASTM E119, limit temperature rise to 250F degrees and reduce radiant heat flux to 0 kilowatts per square meter. SuperLite I-XL – a window and door product that reduces radiant heat flux to one kilowatt per square meter at 60 minutes and is like products widely used in Europe to limit radiant heat flux. Which products do NOT limit radiant heat? Wired glass allows radiated flux on the unexposed side of 35-38 kilowatts per square meter at 37 minutes. Ceramics, such as FireLite and Keralite, allow radiant heat flux of 75 kilowatts per square meter at 60 minutes.